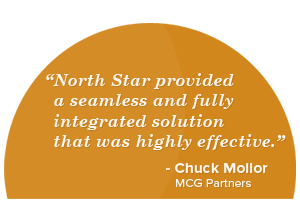 At North Star we’re serious about making things as simple and easy on our clients as possible. Need proof? Our company’s leaders are both named Doug. How’s that for keeping it simple?! Ok, so maybe that was just happenstance, but you get the picture. Our focus is on providing simple, effective solutions and expert guidance from the project quote to the interpretation of the final reports. We’re here to help! Doug Fletcher is a Co-Founder of North Star Consulting Group, and has 25 years of business experience with high-tech and professional service companies. While no longer involved in day-to-day operations Doug remains a strategic advisor to the company. The early part of Doug’s career was with General Electric’s two-year leadership training program. Following GE, Doug worked in management consulting with A.T. Kearney, A.D. Little and EDS performing strategic business advisory services. Mr. Fletcher received his MBA from The Darden School at the University of Virginia and his undergraduate degree in electrical engineering from Clemson University. Doug is also a board member of The Beacon Group, a management consulting firm based in Portland, Maine, and the Greater Gallatin Watershed Council, a Montana-based non-profit that promotes conservation and enhancement of local water resources. Doug previously served as the board chair of the Big Brothers Big Sisters of Gallatin County. When not working, Doug spends time with his family enjoying the outdoors of Montana. His hobbies include fly-fishing, alpine and Nordic skiing, and backpacking. Doug is also an amateur Ironman distance triathlete. Doug Hammell is the President & CEO of North Star Consulting Group. He is responsible for all aspects of North Star’s research operations, client service, business development, accounting and human resources. He has nearly 20 years of experience in leading global employee engagement and client loyalty research projects. Doug received his MBA from the Foster School of Business at the University of Washington in Seattle and is member of the international honor society of Beta Gamma Sigma, which recognizes master’s students graduating in the Top 20% of their accredited AACSB International business program. He also graduated with honors from Montana State University – Bozeman with a Bachelor of Science degree in Marketing. While in college Doug served as president of numerous campus organizations. Doug continues to work with the local community by volunteering and serving on the board of local charities. In his free time Doug can be found spending time with his family, traveling, coaching youth baseball, and enjoying many of Montana’s outdoor activities–skiing, rafting, golfing, backpacking, and fly-fishing.